Never run out of bathroom essentials again. “We created The Bathroom Sink to be intuitive and to anticipate your needs,” said Joe Doucett, founder and CEO of The Bathroom Sink. Life is busy. Errands, meetings, play dates and car pools keep us on the road and over scheduled. Beginning today, however, an online-based tool is making life a little easier with the launch of The Bathroom Sink. Designed using innovative technology and intuitive profile programming, the website prevents users from ever running out of their favorite toiletries. Thus, it eliminates the need to constantly run out for more products. 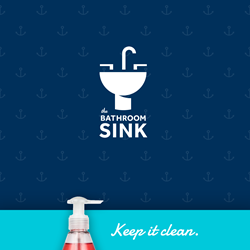 The Bathroom Sink is a subscription-based service, where users customize a plan for delivery of their favorite toiletries. A user profile is created to identify patterns of usage and brand preferences. Utilizing data from individuals profile, the tool intuitively predicts when the product is reaching its end. Users are then sent an email reminder at which point items can be purchased immediately via Amazon. Because of the reminder, products no longer pile up as users make the determination whether or not to purchase based on their needs. In addition to the ability to keep toiletries stocked, The Bathroom Sink also offers users alerts of top daily use items and industry lists from popular beauty magazines and experts. Thereby, keeping users connected to their favorite products, while introducing them to what new and hot. To learn more or purchase your monthly subscription today please visit http://www.thebathroomsink.com. The Bathroom Sink is a subscription-based service, where users can customize a plan for delivery of their favorite toiletries based on their personal preferences. Using the data mined from a profile they develop, the tool intuitively predicts when products reach their end in an effort to eliminate needless errands and time waste. Headquartered in Phoenix, The Bathroom Sink is the brainchild of CEO, Joe Doucett who assembled a team of tech and digital strategy experts to design and develop an innovative technology that transforms the online shopping experience. For more information on The Bathroom Sink, visit http://www.thebathroomsink.com/.